There are lots of reasons to buy a height adjustable standing desk (also referred to as sit-stand desks, sit-to-stand desks or stand up desks), and there are so many designs and options available that finding the best fit for your needs can be a real challenge. We’ve summarised the most important things to consider before buying a desk as part of your office furniture or home office. 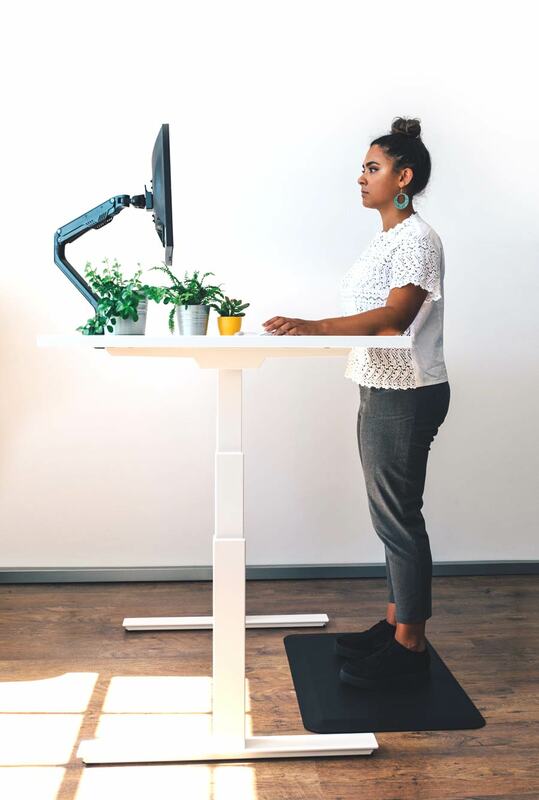 A height adjustable standing desk is a complete desk that adjusts both up and down, to allow you to change your working height to a level that suits you best. Easily alternate between sitting and standing so that you can enjoy a fully flexible, ergonomic workplace and all the benefits that active working brings to the office environment. 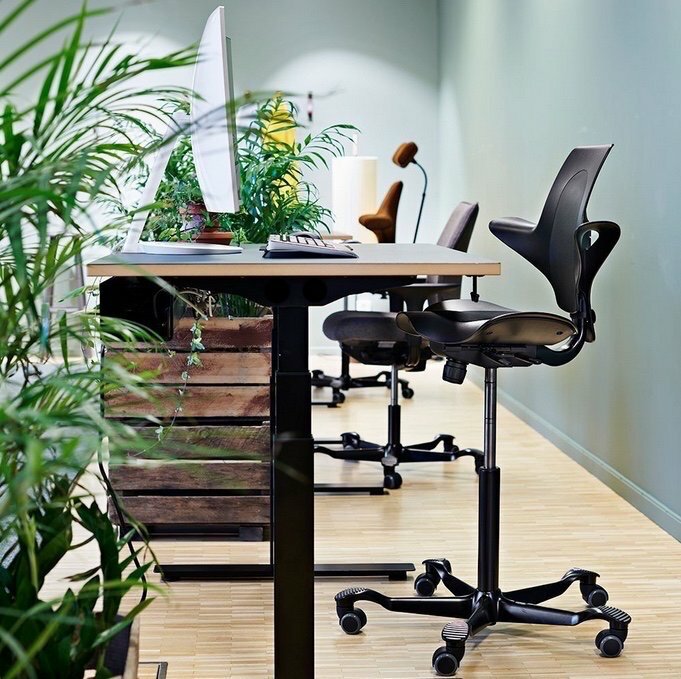 There are various types of adjustable desk, including crank-operated, pneumatic and electric as well as the alternative, standing desk risers and converters. We’ve focused on electric desks here as they are the most popular option. Precision linear motors change the desk height at the press of a button. Speed, convenience and performance are just some of the advantages over most manually-operated crank desks, but they do cost more. A desk’s stability is affected by the quality of its construction, the weight of the frame (the heavier the base the more weight there is to anchor it in place), its maximum height and to some extent the width that it’s set at. Desk frames with leg columns that have three moving sections are generally more stable than frames with two sections because of the increased overlap between the lifting sections. Also the higher a desk can reach, the more stable it is at every point in its height range again because of the increased overlap between sections. Flooring is also a factor that affects stability. Carpet is a less stable surface than wood, tile or concrete and it’s very important to make sure the feet have levelling studs that can be used to make sure that the desk is adjusted to be perfectly level. Check the weight when comparing frames, it’s not always included in the details, so ask. It’s an important factor when it comes to the stability of a height adjustable desk. The Aura frame’s stability is due to its quality steel construction and 40kg average weight, as well as its tall maximum height of 1280mm (excluding desktop) and its three sectional leg columns. This is the maximum weight a desk can safely move, including the weight of the desktop itself. The strength of the desks motors is indicated by its lift capacity and a high rating means that the actuators can confidently withstand larger loads without the risk of overheating or damage. In terms of reliability and durability – the higher the lift capacity the better. Exceeding a manufacturer’s recommended capacity can shorten a desks life cycle. The Aura desk has a motor lift capacity of 120kg and a leg/column capacity of 160kg, evenly distributed. The adjustment range is measured from the lowest to the highest point that the desk can adjust. The distance between is called the “stroke” and is usually in the range of 500-650mm for a true sit-to-stand desk. The amount of adjustment is important as it can affect the ergonomic set-up of your desk. Taller users and anyone planning on using a treadmill with their desk will want to look for one at the top end of the height range. 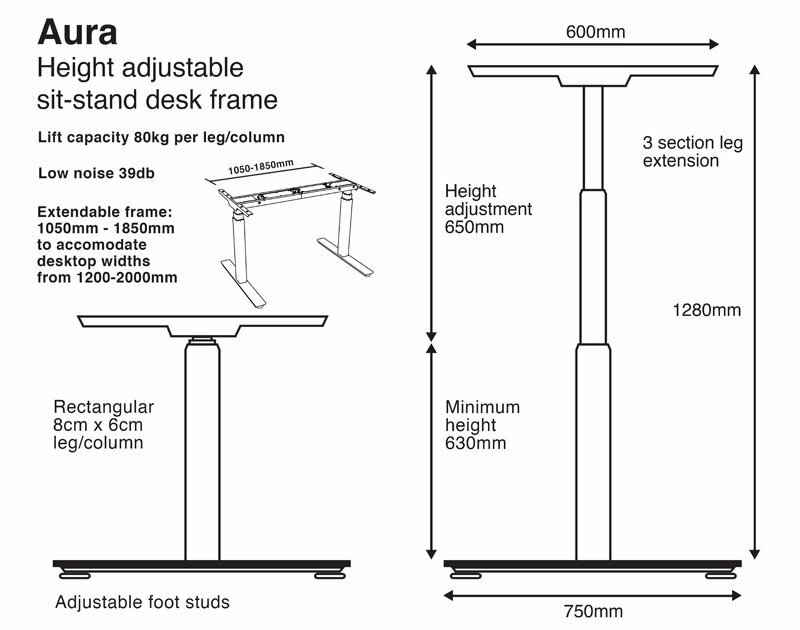 The height of the Aura frame ranges from 630mm to 1280mm – 650mm of adjustment, plus an additional 60mm with castors fitted. All electric, adjustable height desk motors make a certain level of noise during operation; some desks hardly register above ambient office noise which is usually 41 to 44 decibels (dB), while others sound much louder and can be a real distraction! There can also be a big difference between noise when lifting versus descending and fully loaded versus light load. Price is not necessarily an indicator for determining sound signatures so make sure you check before buying. The Aura is one of the quietest desks on the market at 39 dB, barely audible above normal office noise. Electric desks come with either a standard up/down controller with two-buttons or a more advanced programmable controller with a digital readout. Digital controllers usually come with pre-set options allowing users to programme specific height settings. The speed with which a desk moves up and down is measured in millimetres per second with time increasing with the load weight. Check for safety features such as anti-collision, overload, overheat and unbalance protection. Up/down as standard with programmable upgrade option. Maximum speed 40mm/sec. and safety features. Most sit standing desks are delivered for self assembly and vary considerably in terms of ease of set-up. Unless you’re paying for an installation service, the assembly can be at the very least, time consuming! The Aura frame is neatly boxed and comes semi-assembled for a very simple and straightforward set-up. Many adjustable height desks have frames that are width-adjustable too. Meaning a range of different size desktops can be accommodated using the same frame with the ability to adjust the width in order to maximise the stability of the desk. The Aura frame has a width adjustment from 1050mm to 1850mm to accommodate desktops from 1200-2000mm wide. 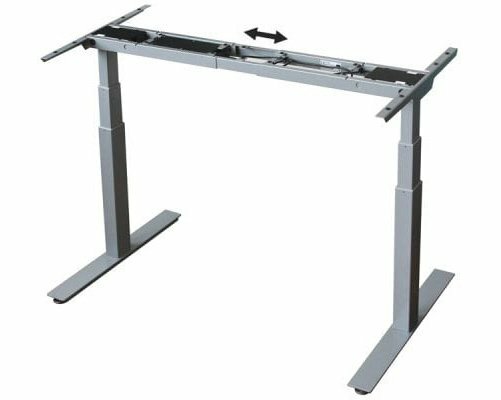 An adjustable height desk could collide with objects in it’s path, both above and below the desk, while moving. 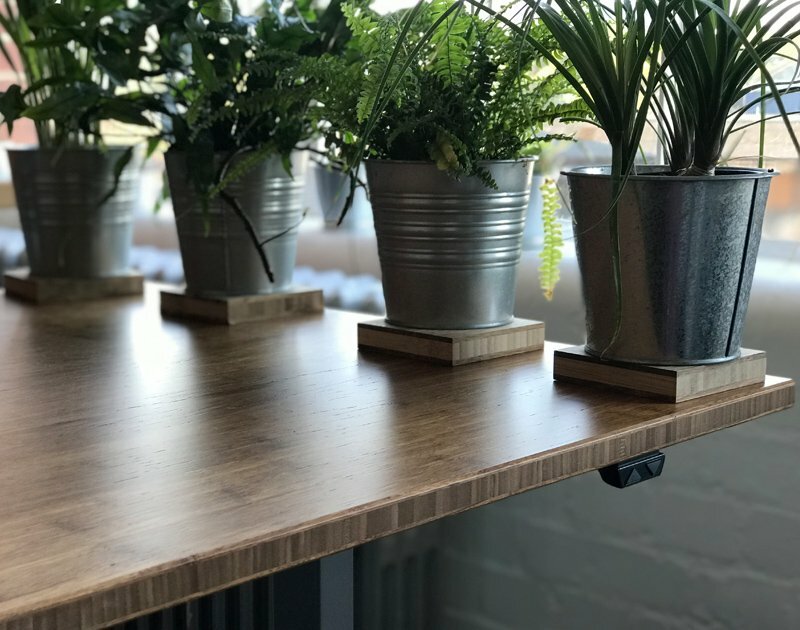 An anti-collision feature will stop the desk from moving if it senses something in its way, minimising damage to the desk as well as the obstruction. The Aura frames anti-collision feature includes 40mm drive back in each direction. Overload, overheat & timeout/unbalance protection. There are two things to consider when it comes to warranty – cover of the desks structure and more importantly the electronics. Cover should include the control box, switch and motors. The length of a warranty tends to be in line with product price and quality. The Aura frame comes with a 5-year manufacturer’s warranty covering both the frame and electronics. Height adjustable sit-stand desks come in many different shapes and sizes with varying features and prices tags. The importance of specific features may well vary depending on your budget and circumstance. Whether buying for a large organisation with multiple spaces or for the home office where aesthetics are likely to score highly, you will be armed with the knowledge of what to look for when choosing the right adjustable height desk for you and your team.